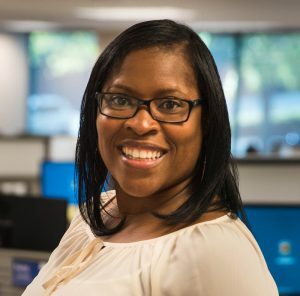 Octavia Gibbs | First Financial Security, Inc.
For self-described people person Octavia Gibbs, taking on the new role of Director of Events is a perfect fit. Octavia is organized and a planner by nature, both traits serve her well at First Financial Security, as they did early in her career. Prior to joining FFS, she spent four years as a program director for the Salvation Army. Her position was part of a government-funded grant program created to assist homeless or at-risk individuals and families find housing. Through the program, Octavia and her team were able to help more than 2,000 people in 18 months secure stable housing. When the grant ended, so did her position, and that led her to FFS. Octavia’s organizational skills probably come in handy in her most important role as mom to three boys: Tyler (8), Ethan (4) and Tristan (2). She, her husband, Michael, and the boys live in Atlanta.